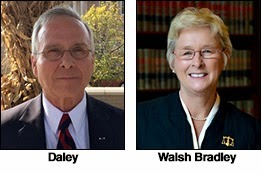 Rock County Circuit Court Judge James Daley is the person that the corporate Republican right wing candidate to try to unseat Supreme Court Justice Ann Walsh Bradley. With just weeks before the election, Daley finds himself having a very bad, horrible, no good day. Toeing the party line for the state Republicans appears to be paying off for Wisconsin Supreme Court candidate James Daley, based on a review of his recently filed campaign finance reports. According to Daley's campaign finance reports the Republican Party of Wisconsin donated nearly $7,000 worth of staff and research services to Daley between January 1 and February 2 this year. "James Daley has shown he's willing to set aside his own views to toe the Republican Party line as a candidate for the state high court," said One Wisconsin Now Executive Director Scot Ross. "While his willingness to flip flop on the issues seems to be paying off handsomely for his political campaign, it raises a huge red flag about his independence as a jurist." Prior to snagging GOP funding for staff and research, Daley changed his position on legislative Republicans' fast track power grab to unseat the high court's current Chief Justice. In December Daley endorsed the GOP's 'Supreme Injustice' amendment to the state constitution to unseat the current court chief, but subsequently changed his stance to "no opinion" in early January. In comments to the media later in January, Daley was again supporting the GOP authored power grab. Daley's campaign finance report on file with the Government Accountability Board disclosed an in-kind contribution of $2,500 on January 7 from the Republican Party of Wisconsin for services from America Rising, LLC, a GOP opposition research group. On January 31 Daley received another in-kind contribution of $4,375 from the state GOP for "wages - campaign staff." Ross concluded, "The last thing we need on the state Supreme Court is more partisan politics. These latest revelations about James Daley set a disturbing precedent about his willingness to set aside his beliefs out of partisan political expediency." And if being shown to be a partisan, corporate puppet wasn't bad enough, the Bradley campaign comes out with a devastating ad with right wing radio squawker Mark Belling calling Daley unfit for the Supreme Court because of Daley's decision to give a slap on the wrist to a man who had severely beaten a child. In an email Friday, Belling said Bradley used his comments accurately and he thinks the case in question disqualifies Daley for service on the Supreme Court. "Unfortunately, Wisconsin conservatives couldn't come up with an alternative that meets even the lowest standard of acceptability," Belling said. It cannot be emphasized enough how important this race is. The corporations and special interests already control four of the seven seats on the Wisconsin Supreme Court. If we ever want to stop and reverse the damage that these greedy bastards are doing to our state and to us, we have to stop ceding ground to them. That means getting off our duffs and supporting Ann Walsh Bradley, as well as the good candidates in all elections from the Supreme Court to your local school board. And yet he will still win! I know Daley as been speaking at various GOP dinners/events as well. We need a Supreme Court Justice that can stand up to that chokin' Psycho-Judge David Prosser. Bradley showed she did not have the mettle to go to-to-toe in the first Choke-A-Palooza battle. I will not vote for a Justice that cannot defeat Psycho-Judge Prosser and that capitulates to choking. We need a Judge that can kick his @ss. He is a feeble old man and there is not excuse for not finishing him off and ending this no-holds-barred contest for justice. (cloak troll) Ann Bradley DID stand up to David Prosser. She stood up to the entire RW group, held her ground. But she conducted herself in an appropriate manner. She didn't storm anyone's chambers demanding a specific action. She didn't bear false witness to what happened. And she didn't press charges because she understands the already tarnished reputation of the court. She held her head high and continues to uphold Wisconisn's laws. She is honest enough to recuse herslef from John Doe proceedings because her son works for one of the law firms named in the lawsuit. Let's wait and see what WMC benefactors Zeigler, Gableman, Prosser and Roggensack do regarding their conflicts of interest in the case. And note for the record- Justice Bradley is not the only Prosser has physically tried to intimidate. He is a bully but she didn't back down. I agree. Bradley had a chance to finish this Prosser dude off. She couldn't do it. Prosser wins be default. We need to elect judges that are ready to fight for justice. Bradley had her chance and let David Prosser win by default. All but one of the justices, Patrick Crooks, witnessed the incident. Justices Annette Ziegler, Michael Gableman and Roggensack have recused themselves from the case, so there's no quorum to move the case to a three-judge panel, which would make disciplinary recommendations to the Supreme Court. You and 8:48 are either the same guy or there are two incredibly uninformed goofballs trolling CogDis. I'd like to suggest that you google and research the events you speak of before commenting. You can go back to eating your cheetos now. What Wisconsin needs in a Supreme Court Justice is not a law scholar, attorney, or even someone with a background in law. What we need are pugilists to take on the likes of Chokin' Dave Prosser. omg, I see the lame theme cotinues. One thing i've noticed is that this race is receiving no press, despite it's importance. If I wasn't gutting emails from Bradely's campaign, I wouldn't even know there was a race on. Thats why she will probably lose. The press is sitting this one out and thus, only the fascists will bother to vote.